John Payne is Capt. 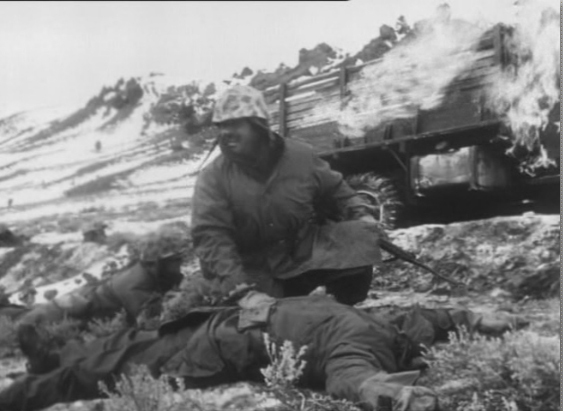 Sam McKenzie, leader of the United States Marines Easy Company as they chase North Korean forces along the Chinese border. All seems to be going well for them until suddenly the Chinese Army flanks them and has them totally outmanned and outgunned. Now they must hotfoot it back to safety, but the way is long and they are constantly having to battle both the Red Army and the frigid cold. Supplies dwindle, casualties mount, their equipment and vehicles are destroyed, and all hope is seemingly lost - but Easy Company finds inspiration from an unlikely source: an unopened bottle of scotch belonging to Captain McKenzie. Through flashbacks, we learn how this bottle was acquired and explore his rocky relationship with the lovely Mona Freeman, and why it holds such significance. 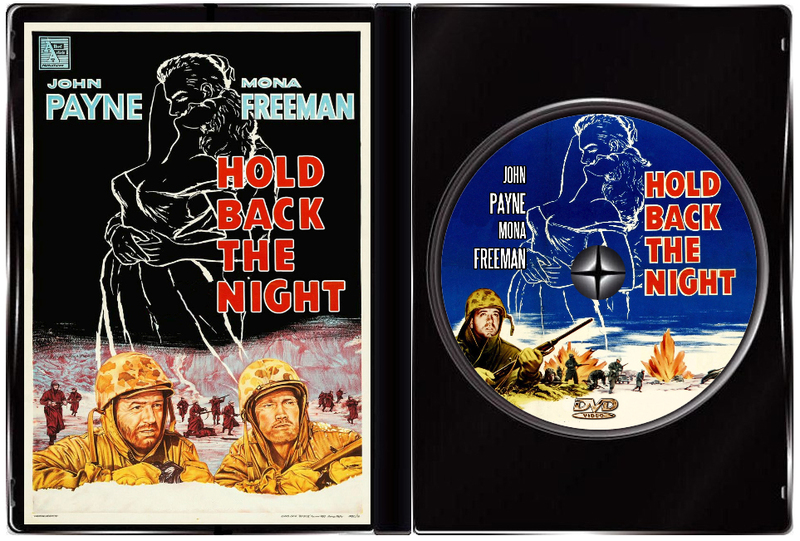 An extremely rare and under-appreciated film, Hold Back the Night based on the best-selling novel of the same name by Pat Frank. An extremely interesting and unconventional film, it almost seems like it would have more in common with an episode of the Twilight Zone than other war films of its time. 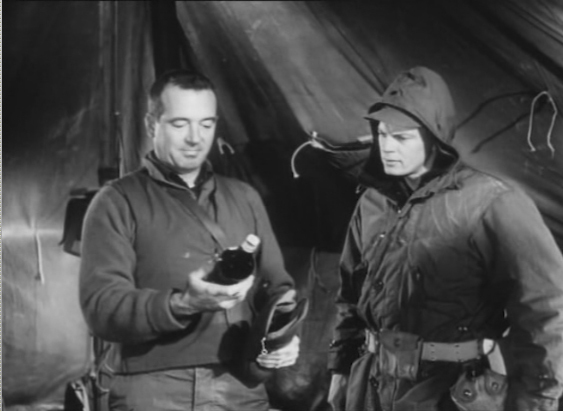 That is not to say that any of the horrible realities of war are glossed over (they aren't) but the focus on the drama surrounding the bottle of scotch and how it relates to the human spirit is certainly what stands out in this forgotten gem of a picture. 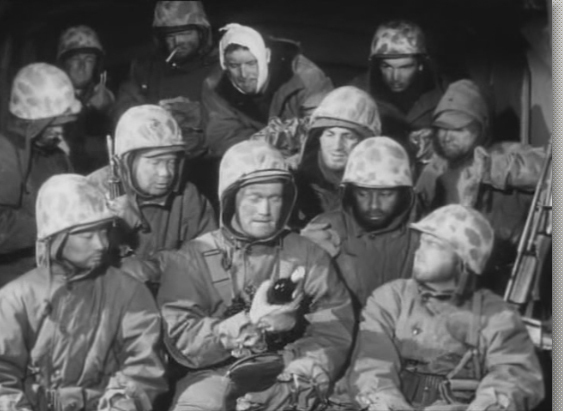 Director Allan Dwan was certainly no stranger to the war genre (although he did excellent work in all genres, from silents starring Douglas Fairbanks Sr. to Shirley Temple films) as his 1949 film THE SANDS OF IWO JIMA steered John Wayne to his first Oscar nomination. In the cast we find future television stars, Chuck Connors (Rifleman) and Peter Graves. (Mission Impossible) There are several, well done combat scenes throughout the film, and some impressive pyrotechnics as well. One of the best to come out of Allied Artists!